We all know LeBron James. 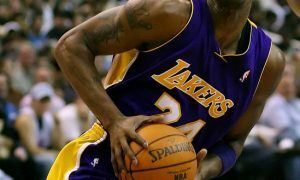 3-time NBA champion, 3-time NBA Finals MVP, 4-time NBA MVP, 12-time NBA All-Star, so on and so forth. LeBron is not only the best player in the league and arguably has been for the past decade, but he’s also on his way to becoming the best player in NBA history. LeBron has made the NBA Finals 6 seasons in a row, with 2 different teams. He lead the Cleveland Cavaliers to an NBA Title in 2016 despite being down 3-1 in the series to the best regular season team in NBA history. So what about Draymond Green? Green is a nice player who possesses a good shooting touch and an aggressive defensive style. He’s a team player and a very valuable asset to the Golden State Warriors. But let’s be honest, Green is the third or fourth best player on his own team behind Kevin Durant, Steph Curry, and Klay Thompson. 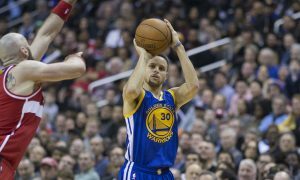 He was an integral part of the historic 73-win season that the Warriors produced last year. But unfortunately, Green’s claim to relevancy is for his dirty style of play. During Game 4 of last season’s NBA Finals, LeBron and Green got tangled up, and when LeBron stepped over Green, who had fallen to the court, Green swung his arm and hit LeBron in the groin. Fast forward to the Warriors 126 – 91 victory Monday night over the Cavaliers, which snapped a 4-game losing streak to Cleveland, where Green made the headlines once again. This time, for a football-style hit on LeBron during a fast break. LeBron may have used his acting skills and flopped a bit, but no one is arguing that Green delivered a clean basketball play while hitting LeBron. 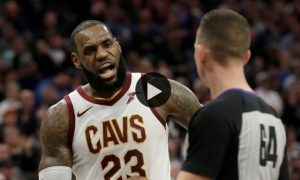 Green was assessed a flagrant foul and an ensuing technical foul after a scuffle with LeBron’s bodyguard Richard Jefferson. As Green headed to the bench he brought out his comedic skills and mocked LeBron for his apparent flop. LeBron had his own thoughts on the incident. “I think his shoulder hit me in the face,” James said. “It happened so fast, I didn’t even know who it was. But I’m all right. I’m a football player.” Whether or not it was intentional, Green continues to make a name for himself by poking the bear. While the Cleveland – Golden State rivalry continues to heat up, the LeBron – Green soap opera continues to blossom as well. Draymond Green is a relevant talking point because of the powerful brand that is LeBron James.